This is the talk page for the article "Anakin Skywalker." Anakin Skywalker is within the scope of WookieeProject: The Clone Wars, an effort to develop comprehensive and detailed articles with topics originating in or related to the Star Wars: The Clone Wars television series. Anakin Skywalker is within the scope of WookieeProject: Rebels, an effort to develop comprehensive and detailed articles with topics originating in or related to the Star Wars Rebels TV series. Anakin Skywalker is within the scope of WookieeProject Novels, an attempt to build comprehensive and detailed articles with topics originating from any Star Wars novels. Star Wars 2 & Darth Vader 1 information lacking. Someone needs to update History and Powers & Abilities. Hey guys. I just wanted to say i was looking on the page and i noticed some grammar mistakes that i was trying to fix above the biography section. Here is the quote "Before he died, Vader learned he also had a daughter, Leia Organa. She subsequently married the smuggler Han Solo and had a son named Ben. Ben became obsessed with his grandather(?) and also turned to the dark side, becoming Kylo Ren, master of the Knights of Ren, and apprentice to Snoke, the Suprme(?) Leader of the Empire's successor, the First Order." And i tried changing it but i don't have the permission too as it's protected from editing i was just trying to bring this to the attention of the group so it can be resolved. By the way i'm new here so i don't know how everything works so.—Unsigned comment by Eclipse3161999 (talk • contribs). I say yeah. If that's been wrong before and Pablo has more credence, then we should go with it. It matches up with TPM, at least. 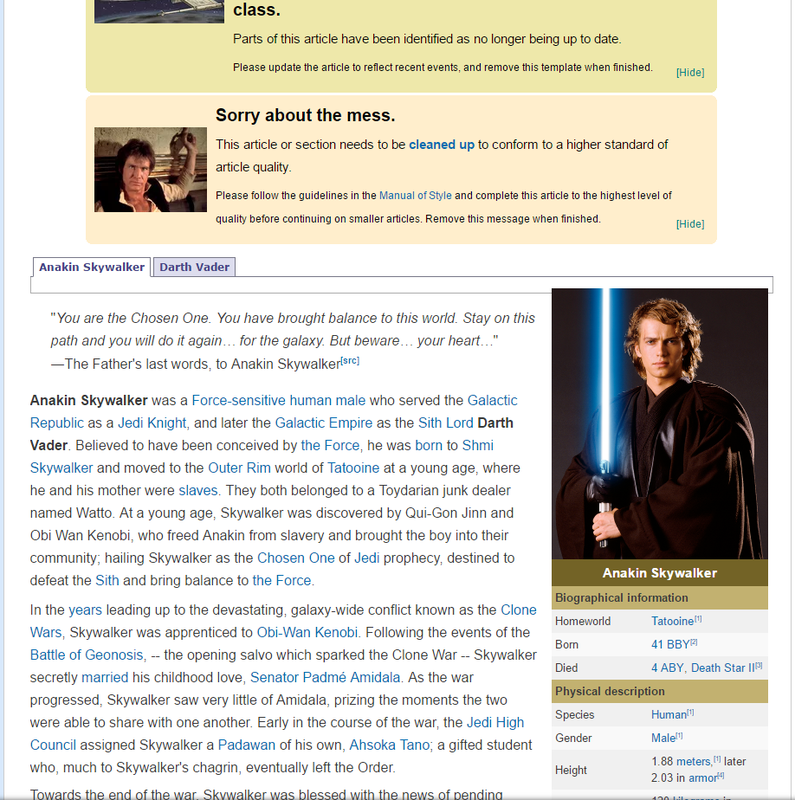 The image of Anakin's page is not a good idea. If it was the image of Darth Vader it would do much better—Unsigned comment by Atrocitus8 (talk • contribs). They are small samples that I did in a few rushed minutes, and could obviously use some work, such as the fact that the tabs are all the way to the left instead of to the right. I would like to bring into question the validity of Anakin being the chosen one and fulfilling the prophecy. A prophecy is something that is foretold to happen only once. This prophecy of a chosen one to come and bring balance to the force was around for thousands of years, and not once before Anakin had there ever been a chosen one. It seems to be clear, to me at least, that when TFA takes place, the force is at an imbalance. So had Anakin been the chosen one and the prophecy (that had been around for thousands of years) was actually fulfilled, why has it not even lasted 30 years? I really think that anything in legends that states Anakin had fulfilled the prophecy should be removed, or at least moved to Legends material (as I think that this is only a matter of opinion). JRT2010, do you really think that anyone that is in charge of Star Wars canon material is going to come right out and state directly whether or not Anakin was the Chosen One? Doing so would give away too much information of what we can expect to happen in Episodes 8 and 9. You are really making it obvious that you are not even willing to look at the information I have provided, and is really making me question whether I made a mistake of trying to be a part of this community. 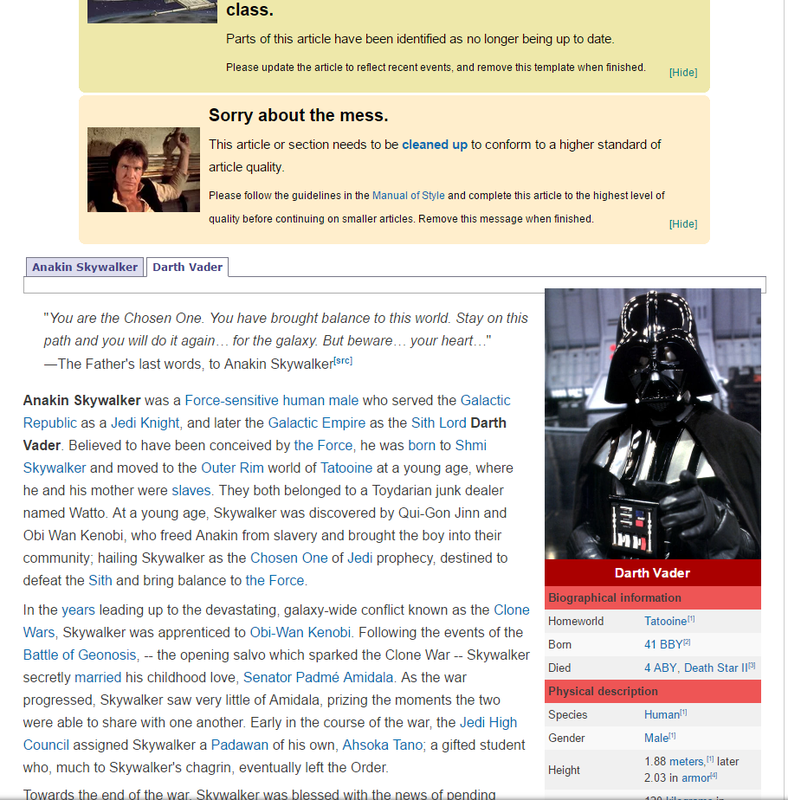 Just answer this one simple question, if that caption is considered canon, why is that canon information not found on Anakin's database page or Vader's database pages? It's been a while since I've edited this page, but as I look at the page now, it's (forgive me) quite the mess. I don't want to sound entitled, like "what did you do to my work? ", but... Why are there so many paragraphs devoted to the comics and the movies, going into so much detail about what happens? I get that brevity depends on each editor (and that the films are kind of a deal), but most people browsing this page have likely seen the films, and unless there are details from novels or reference books, they should not be so long and/or encompass like five sections. Extensive descriptions should go into the pages they belong to (say, if you want to go into detail about what happened in such-and-such issue of the comic, go to that issue's wiki page and work on it, I'm sure they need it). Each section should have less images, too; about one image or two per section, three is the section's rather long. Long paragraphs are hard to read as well, especially if they have no links instersperced throughout. I say all of this because I believe that, in a character page this long (due to Anakin's sheer amount of appearances) and others like it, all editors should strive to make their additions as succinct as possible, despite how much we'd like to contribute. The intro says that Anakin was born on Tatooine but no canon source confirms this, to my knowledge? When Padme asks how long he has lived there, Anakin says, "Since I was very little. Three, I think," implying he was not born there, though he could have been talking about Mos Espa and not the planet as a whole.